The Unaflex Rubber Corpora- tion of Ft. Lauderdale, Fla., is offering copies of a new "short form" catalog covering its lines of expansion joints, flexible con- nectors, and custom hose. The catalog contains dimen- sional drawings and charts, pho- tographs and descriptions of the makeup and capabilities of the products, and cutaway drawings of construction details. Unaflex also has available complete tech- nical catalogs on all its expan- sion joints and rubber hose prod- ucts. The U.S. Coast Guard has is- sued an advanced notice of pro- posed rulemaking concerning new offshore supply vessels. Geared for speed. Light weight, high performance gears from ZF. ZF presents the last thing you'd expect from a smaller gearbox. More speed. BW190 marine gear series is the compact, high performance gear line built for pleasure craft in the 40 to 60 ft. range. Pound for pound, they handle more torque than any other gears in the world. The result? You can use a high performance engine. And build a faster boat. The BW 190 series is designed for dependability and smooth operation. With multiple disc clutches, hydraulic- ally operated, oil cooled and pressure modulated for short response and smooth shifting. And precision helical gears for increased efficiency and reduced noise. ZF, you'll get all the confidence that comes from knowing you've specified the best. The best in precision. In quality. In long-life performance and customer service. Just what you'd expect and more from the world leader in drive system technology. 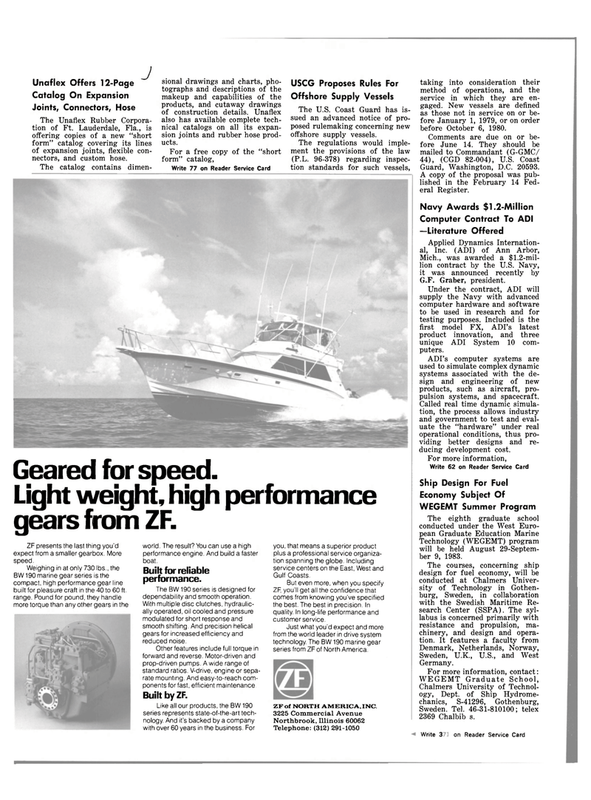 The BW 190 marine gear series from ZF of North America. Telephone: (312) 291-1050 taking into consideration their method of operations, and the service in which they are en- gaged. New vessels are defined as those not in service on or be- fore January 1, 1979, or on order before October 6, 1980. A copy of the proposal was pub- lished in the February 14 Fed- eral Register. Under the contract, ADI will supply the Navy with advanced computer hardware and software to be used in research and for testing purposes. Included is the first model FX, ADI's latest product innovation, and three unique ADI System 10 com- puters. ADI's computer systems are used to simulate complex dynamic systems associated with the de- sign and engineering of new products, such as aircraft, pro- pulsion systems, and spacecraft. Called real time dynamic simula- tion, the process allows industry and government to test and eval- uate the "hardware" under real operational conditions, thus pro- viding better designs and re- ducing development cost. Technology (WEGEMT) program will be held August 29-Septem- ber 9, 1983.